"Human rights" and "humanitarian action" both imply a specific understanding of the term “humanity”. Yet, any such definition depends on those who have the power to define it and, thereby, single out those belonging to humanity -- and those who do not. In the course of the last 150 years, the meaning of humanity has expanded remarkably due to contesting notions of political interest, emotional inclination and social inclusion and exclusion. In my research, I seek to retrace part of this change in the context of U.S. humanitarian interventionism in the late 19th and 20th century. Specifically, I wish to know since when, how, why U.S. actors invoked humanity / humanitarianism as a principal cause for social, political and military action. 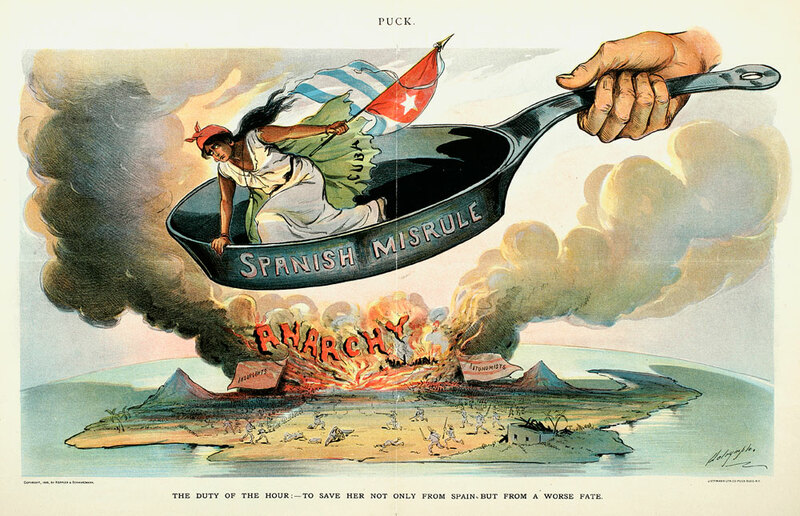 To this purpose, I am currently investigating one case study – the U.S. intervention in Cuba in 1898 (often labeled the “War of 1898”) -- to understand the genesis of the term at a particular moment in time in the context of discourses of aid and interventionism. Image source: Keppler & Schwarzmann, “The Duty of the Hour:— To Save Her Not Only from Spain but from a Worse Fate,” Puck, 1898.Lithograph. New-York Historical Society.